Lapis lazuli has been used in jewelry, carvings and amulets for thousands of years. It is a stone prized for its intense blue color. 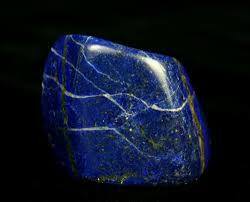 The name Lapis Lazuli comes from the Arabic word lazward, from which the word azure comes, which means blue. Ancient Romans used to call it "sapphires," which was subsequently applied to the blue variety of corundum we know today as sapphire. Egyptians regarded lapis lazuli as a heavenly stone and often used it on the statues of their gods and in burial masks, as protection for the next life. The stone has been used in many famous pieces throughout history, including the mask of Tutankhanem, or King Tut. Egyptians used lapis lazuli for cylindrical seals. Sumerians, the supreme lapis lovers of antiquity, were willing to spend years traveling from one end of Asia to the other, on mining expeditions for the gem. In fact, the stone was mentioned in their 2650 BC epic of Gilgamesh. During the middle ages, ruling class art patrons demanded that painters use blue paint that was made from blue lapis. Men of less means had to tolerate cheaper blue pigments made from indigo or copper.